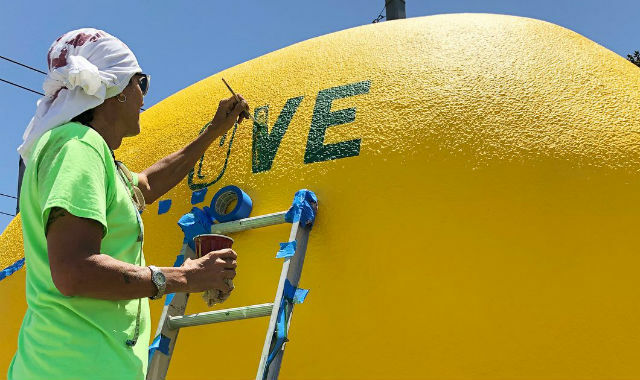 The giant lemon in the East County city of Lemon Grove will turn 90 on the 4th of July and look as if it’s new. The 3,000-pound landmark was recently repainted thanks to the support of the city, the Lemon Grove Historical Society and Home Depot. Its restoration was celebrated in public ceremony on Wednesday. “Thanks to all who celebrated our zesty friend this morning. Here’s to our lemon’s next 90 years!” the city said on its Facebook page. The iconic 10-foot by 6-foot sculpture, located at Broadway and Main Street next to the Orange Line trolley tracks, was built as a parade float in 1928 and later plastered to make it permanent. The community was once the center of thriving lemon groves that have long since been replaced by homes. At the base of the sculpture is the inscription “Best Climate On Earth,” a former community slogan. The sculpture actually predates the city, which wasn’t incorporated until 1977. Lemon Grove notes that it is home to the largest fruit sculpture near a mass transit station.